A new era will replace the current era, Heisei in year 2019. 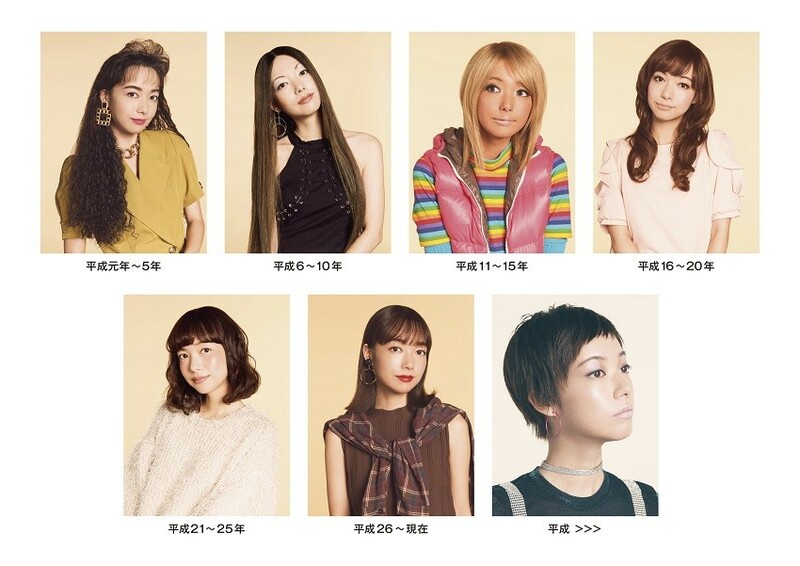 This time, Shiseido has appointed a model to show the beauty trend transition as the result of Heisei 30 years research, from the beauty view point. Heisei first year is the year when the bubble economy reached the peak. It is the period where women in Japan used to utilize their strength and femininity. A characteristic of makeup within this period is lipstick with a vivid color such as red or blue rose pink. Overall it is natural make up except for mouth, even for the eyes part they have a very feminine made up with only slight colors such as rose and purple colors. The mainstream of hair style is long straight hair, "One Length" with perm applied only to the tip of the hair. Besides, "Uphill hair" with thinly trimmed hair are also the symbol of this period. After that, it entered into a long recession and inexpensive products became popular. Since then, personal computers and mobile phones began to become common, and information can be obtained has been increased dramatically. "Girl’s culture" such as thick bottom boots and mini skirt increased. In addition, brown hair, thin eyebrows and small face makeup boomed. Besides, the makeup such as pearl eye shadow, beige and brown series lips which are the makeup of near future makeup has become popular. For hair, “Layer cut” which has layer at the tip of the hair, combing shaggy hair style were popular during this period. The rate of young women dying their hair had exceeded 90%. During this period, the fashion were categorized into girls, elegant, Harajuku backstreet and others. "Girl’s culture" has evolved impressively centered at the area in Shibuya. The fashion style such as plain colored clothes, flower hair ornaments, and other unique makeup were popular. The greatest feature was the sunburn skin. There were people who actually sunburn, while some of them made up with a dark colored foundation. The finishing such as eyeliner which covered the border of eyes, thin colored eyebrows, and other makeup which emphasized on eye makeup were popular as well. Popular hair colors are bright and high toned colors such as yellow, yellow, ash, hi-bleach, etc. There were even more people dyed hair during this period. During this period when the recession became more serious, there was a growth of desire for marriage, due to insecure feeling. A marriage boom started, and women's "conscious to become popular and liked by surroundings" became stronger. The epidemic of romantic fashion using frills and lace has increased as well. "Thick makeup" that could naturally produces femininity was popular. The eye liner which bordered the eyes, mascara, and eyelashes which could show bigger eyes were popular, while for mouth glossy make up was popular. It was the period where you could see the beauty consciousness such as the boom of black eyes contact lens and eyelash extension. Hair makeup also tend to became more concerned. The popular style were silhouette that arranged with hair extension or hair ironing. During this period which East Japan Earthquake of 2011 happened, the values mindset of the whole societies and mindset as a consumer were changed. Women will ask themselves of what they actually need and intend to adjust their consumption trends towards their needs. The fashion tended to shift to "simple and easy", and came the healing style boomed. Natural makeup became the trend. 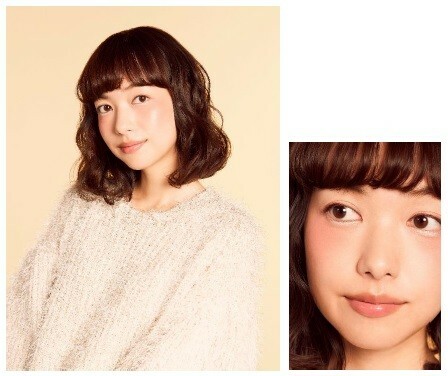 The makeup such as "eye bag makeup" which pearl highlight the lower eyelid, "Yuagari’s(after bath) cheek" which made rouge at the cheek's upper part have become popular. Popular hair style were soft and fluffy curly hair styles, and natural style with airy feeling which has the tip of the hair wrapped towards inside. In end of Heisei period, the tourists who visit Japan has increased and the economic was expected to recover. 80s and 90s fashion such as high waist, producer winding and sneaker became popular as a symbol of revival. The keyword of makeup during this period are "Lady" and "Mode". It features a bright, short, and thick eyebrow. The mouth makeup also became fashionable with bright lipsticks such as bright rose and vivid pink color. The Bob hair style is popular. "Front hair bang" and "see-through bang" which hair is thinly trimmed became popular. In future, it seems like women tends to enjoy diversified fashion and makeup. It will become the era that woman will not choose only one trend fashion, instead they will choose the one suits themselves from all the information collected. The “personalized fashion” which distinguishes individuality is likely to accelerate even in the world of hair makeup. As an example, “Futuristic fashion and makeup” which are popular in the second half of the 1990s will revive into a new form.